Awareness about mental health needs to be taken more seriously and the stigma needs to be taken away of being scared or ashamed. – Normally when you would start to read an article like this – the topic usually would be about one or the other – not both at the same time. If we were physically sick, would we not seek the help of a medical professional? There needs to be more discussion on what is “normal and acceptable mental health” in our youth, adults and in our growing aging population and we need to be brave enough to discuss it openly and look for early signs of behavior that is not “normal and acceptable mental health”. We need to be prepared with the proper tools and knowledge to help those who are in need and are unable to realize that they require such aid. Alzheimer’s disease, which is the most common form of dementia currently affects over five million Americans and that number is expected to more than triple by 2050. 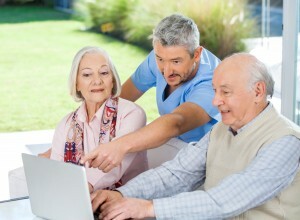 How is our aging population going to be equipped to handle their finances? Are these people making the best choices in how they save and spend their money? Are there people out there looking to take advantage of this group of people because they know that their checkbooks are not being overseen by someone who may be more capable to handle their financial decisions? Currently there are some regulators and firms that are working on the issue of dealing with clients with a diminished mental capacity, but they have a long way to go. Regulations currently require that advisors protect a client’s privacy and follow through with the wishes of such clients, regardless of the consequences. But advisors are becoming more wary, that by following the rules, family members could possibly bring on lawsuits claiming that the client did not have the full capacity to make financial decisions. According to some recent publications, financial advisors are among the first to recognize the signs of declining memory – the handling of money is one of the first skills to fade. We do not want someone who is in this position to deplete their nest egg or fall victim to scams. There are some investment firms that have started to educate their advisors regarding dementia and elder care abuse. In some instances, if there is some doubt of the client’s capacity, some firms may put a freeze on the transaction and make every effort to contact family members. There are currently no clear cut rules governing how to handle these situations and laws if any are governed by the states. On a federal level they are working on a clause that would allow brokerages to delay withdrawals from older client’s accounts if they suspect there is fraud. According to AARP, they are currently working with the American Banking Association Foundation to produce educational materials for consumers, financial caregivers and bankers on age-friendly banking, including on how to address dementia, fraud and financial caregiving. As a proud member of the “sandwich generation”, my family is still at home and I am a caregiver to my 85 year old mother. Three years ago, I took over as caregiver, financially and otherwise for my mom’s benefit. It is not an easy task to take away responsibilities from our parents, when they have been doing these things their whole lives. But we need to be diligent with our decisions and know deep in our hearts that it is the right choice for their well being. Look for the warning signs … and be prepared to take away the debit, credit cards and checkbook… you can save yourself and your loved ones much heartache! This entry was posted in Blog and tagged Alzheimer’s disease, Financial health, mental health on October 26, 2015 by c12643402.